Business and Finance Services (B&F Services) offers a wide range of entrepreneurial services to corporate clients and small businesses since 2005. Over the last decade we have launched more than 3000 companies and have helped numerous entrepreneurs to establish and develop their businesses across Europe and in particular in UK. Our team of consultants is highly qualified at: Arranging Finance, Structuring Finance, Business planning, Business formation, Business Strategy, Accounting, Business workshops and Marketing. Address: 68 King William Street, Monument/Bank, London, EC4N 7DZ. 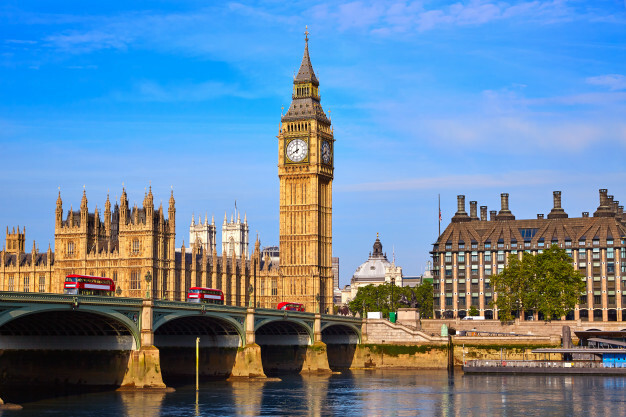 It has been evidenced through various sources that the UK startup revolution is yet to demonstrate any signs of slowing. This statement can be supported by the growth from 608,000 businesses established in 2015 to 660,000 just a year later in 2016, showing an 8.6% growth rate (+52K). Furthermore, this identifies that the market remains to be very excited, with growth expected to continue, reaching new levels. This is a process that B&F Services are proud to have had a part in and are endeavouring to help further improve these statistics to the best of our professional ability looking into the future. The key focus of Threedium is to bring products to life within online space through the development and incorporation of their online 3D merchandising solutions. The fundamental purpose of Threedium’s solutions is to help create a far more engaging and satisfying shopping experience for the end consumer. This is therefore expected to ultimately increase purchasing intent and overall conversion to sales. Having initially met his co-founder during his master’s degree in London, Lode and his co-founders concluded that they all had a similar dissatisfaction with the current state of the online shopping market and their current solutions. They therefore set out to establish a solution that would enable online retailers to begin to close the gap between online perception and reality. Ultimately, they set out to create a service that was able to fully represent a product in its entirety, reducing consumer dissatisfaction and increasing conversion rates. 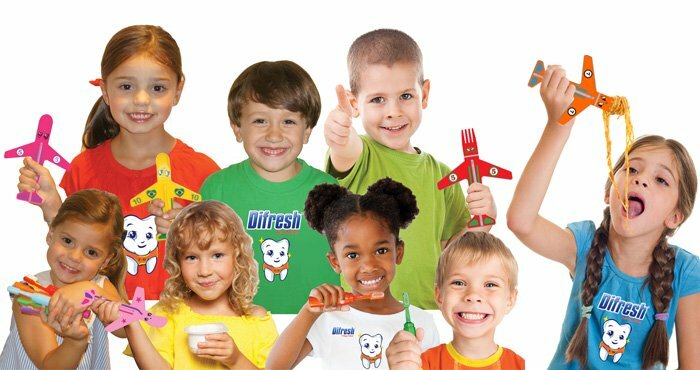 How did you find out about B&F Service? Having previously worked for a start-up that had worked with B&F Services to great success, the co-founders at Threedium believed that we would be able to help them in their efforts once again. They believed that the business plan provided by B&F Services was an in-depth and well detailed account of their business, outlining all of the necessary and value adding features of the business with great effect. Lode believed that the main features of the business plan included the service description itself, providing a detailed outline of the purpose of the services and how these will and can add value to the market. Secondly, lode believed that the financial projections were an essential element to the creation of the plan as this is ultimately what the investor would be interested in. Did you attempt to fundraise by crowdfund platforms? In the experience of Lode and Threedium specifically, they were very broad in their attempts to gain funding, approaching a number of different angel investors and accelerators and networking events. At one of these events, Threedium and the co-founders were faced with the possibility to present their idea to an accelerator. Fond of the idea, the accelerator provided Threedium with a further opportunity to present their idea to an additional 11 different investors. This resulted in Threedium being amongst 8 companies that were chosen for an investment sum of £100,000. Outlined in the initial question, the original inspiration for all three co-founders establishing their own business in this market derived from their shared displease in the current solutions offered in the online shopping market. What do you believe are the fundamental steps to a successful establishment? In his explanation, Lode believed that the fundamental steps to a successful business establishment included a business idea that is setting a solution for an issue that the business world or specific market is currently witnessing. At the same time, Lode believes that this solution must provide a substantial level of added value to the market. 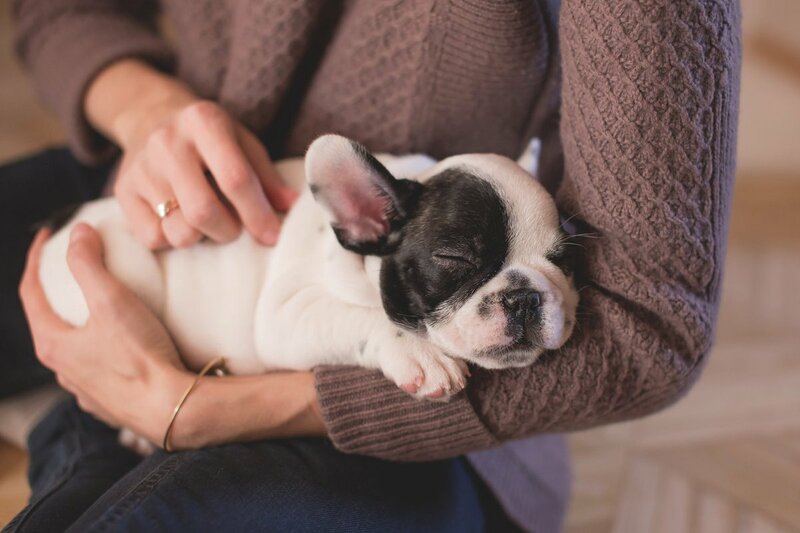 In addition, Lode believes that alongside a creditable and value adding solution, a business requires a truly committed team that embody the core values of the business to ensure potential success. Lastly, Lode believes that the final element to a successful establishment is networking. This is because business is largely oriented around who you know. Therefore, through networking a startup I able to gain the levels of exposure that are required for its resulting success. What do you believe are the key factors in choosing your co-founders? Lode therefore believes that with each member of management being able to bring forward a different skill set, in a cohesive environment, the team is able to demonstrate extremely high levels of productivity. Alongside this, with all co-founders having similar interests and passion in the market, they are able to provide their service in the best way possible. Lode therefore believes that when establishing a business most effectively, all co-founders should not only have a shared passion, but a mixed skill set that are able to compliment the activities of the business. What was the initial vision when you first set out to establishing a business? Did this vision change? Once again, in the case of Threedium, the initial business vision was the offering of a service to create 3D configurators for businesses within a number of different consumer goods industries. However, upon the business development stage Threedium’s vision, although remaining on the same track, has broadened with the realisation of new applications for their technology. New applications would include the integration of digital merchandising and the compatibility of their software with Virtual reality facilities. In this segment Lode suggests that in stages of establishment the ability of a business to adapt is essential to its success. Lode further suggests that businesses that are to focused on their initial products can often lead to self-destruction as they aren’t able to see the wider picture and adapt their business to the wants and needs of the market. Did you encounter any obstacles and how did you approach them? Lode outlined that as expected Threedium have encountered standard business related obstacles that include late payments, timeline altercations etc. However, he suggests that one of the largest obstacles for him and the other co-founders was time management. 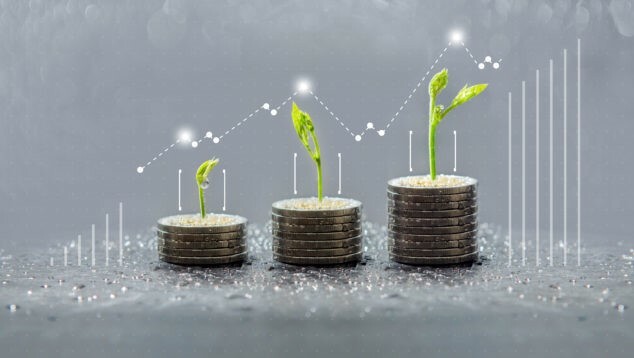 Lode explains that the securing of investment is a very lengthy and time-consuming venture and mixed with the running of a business it can be fairly challenging. As a result of this, Lode outlined that this is one of the key benefits with having multiple co-founders in the business. This allows tasks to be distributed amongst the team, allowing for a more organised and managed approach. How important do you think branding strategy is in establishment? What steps did you take to make sure your branding represented your business correctly? As highlighted by the co-founder of Threedium, Lode, for their branding strategy they largely focused upon the attendance of as many startup and networking events as possible. This is with the core intention of gaining as much exposure as physically possible, aiming to gain customer associated with the 3D market. How would you rank the importance of a specific and detailed business plan in your investment efforts? Lodes states that working with B&F services allowed for a very close interaction, with a number of meetings allowing for a well outlined and detailed approach to the business planning process. 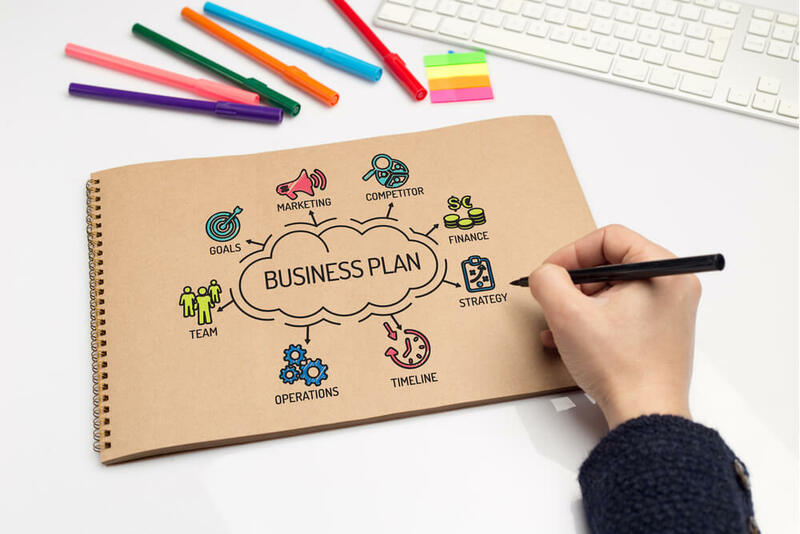 Lode also suggests that during the stages of business planning, Threedium were undergoing a number of key business decisions that had significant impacts on the structure and end result of the business plan. 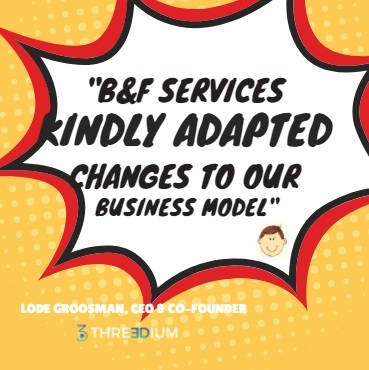 B&F Services were able to take on these changes and amendments to Threedium, allowing for a well outlined and accurate representation of the business. Threedium, stated that the importance of this specific and detailed business plan was fundamental, as it allowed the investors to see a true and accurate representation of the business and what it is going to become. Lode further added that the detailed plan was also nicely wrapped up into a pitch deck to allow the investors to see an overview of the business before viewing it in more depth. How many investors did you approach and pitch to before success? Although Lode highlights that this is not common within investment, Threedium did not utilise any crowdfunding schemes and were lucky enough to have gained funding through the first accelerator and investors approached. He states that he believes this is as a result of the well rounded and developed product that Threedium were able to clearly and accurately demonstrate the value of to the investors. An additional element that was proven beneficial to Threedium was the pre-existence of customers on a small scale. This provided investors with the confidence that this is a working product and that the business simply needed funding to up-scale this process. What advice would you like to give to anyone listening that is currently thinking about or in the process of establishing their business? In this process the one word that Lode used to sum it up was ‘persistence’. He stated that it is not an easy journey and a lot of hours, hard work and dedication have to be committed to the cause with little initial financial rewards. However, if you truly believe in the cause and the success of the business it can be made achievable. Working with friends is not easy. It is important to leave your ego behind and focus all attentions on what is best for the future of the business. Passion and motivation. Lode puts across the point that it is essential for you to have a true passion for the purpose of the business. He says that it is this passion that will allow for the management to remain positive and drive the business to success, even when times are hard. Networking, Networking, Networking. Lode puts across the point a few times throughout the presentation that networking is vital in the success of a business in its early stages. This allows relationships to be created and increased sales to follow. Looking into the future, what are your next goals/targets? Looking into the future, Threedium are currently working on the next stages of development. This would be through the incorporation of a platform, allowing around 80% of their development process to be automated. This would result in lower overall development costs and allow the business to upscale significantly from around 10 projects per month the ability of processing 100’s. Is this something that you would like to do again in the future? In this question Lode suggested that, although you may face a number of difficulties throughout the process, he also had a lot of fun throughout and met new people and learnt new things. As a result of this, Lode has stated that if the opportunity once again rose he would be extremely interested in once again going through this life changing process. Is it recommended to Approach investors from outside of the UK? Overall the general consensus suggested that there is no reason as to why investment from outside of the UK should not be considered. This has further been made easier through crowdfunding platforms that allow investors from all geographical locations to invest in businesses under a singular body. However, it is suggested that it can often be seen as easier taking on a domestic investor because of the ability to meet face-to-face, which is often not possible in cases of foreign investment. Are there any specific platforms that would be advised for the purpose of crowd funding? As a general principle, there is not one crowd funding platform that would necessarily be suitable for every business as a result of the specificities that are associated with each. This would therefore result in some platform being suitable for some businesses and potentially not others. However, the crowd funding platforms that B&F Services often work in close association with would include Crowd Angel and Syndicate room. Having not had much experience with crowd funding platforms, Threedium used collider, being an accelerator located in both the UK and Amsterdam. Why equity funding and not other solutions like ICO funding? Having been only introduced to the market as a method of funding in recent times, ICO funding is yet to have grabbed the true attention of the market. Alike all other methods a sense of confidence would also need to have arisen around this funding method before investors and business alike would be truly accepting. Therefore, it can be accepted that cryptocurrency is an ever evolving market and would potentially see increased growth into the future, but at a stage in which the practise has undergone vigorous testing and is widely accepted and a funding method. What is the best suggestion for businesses that have low available cash flow in their initial stages? The first suggestion that is made by Lode adds to a previous point of being prepared to work long hours. He suggests that once the UK market closes, typically at around 5PM, there are a number of other countries that are still trading. In essence, he suggests that you should not limit your market domestically, but should seek wider opportunities. Additionally, when starting out a business it should be estimated throughout the planning process to what costs are required for the establishment of the business? This would therefore provide the entrepreneur with sufficient preparation to acquire enough cash to mitigate for any circumstance of poor cash flow. Once again this would fall back to the point of networking and gaining the business as much exposure as possible in its initial stages of growth. This will help to build clientele and evidently result in an increasingly investable business.